Once your Kombucha is brewed (7-14 days) you can drink it as is, or you can choose to flavour it. I have been drinking it unflavoured up until just recently. I found you can change the flavour by using different types of tea, for example Black, Green, Oolong, White, Jasmine and then by choosing different sugars, white, coconut, raw etc, the flavour of the tea will be different. My favourite is just Green Tea with Coconut Sugar. I want to try a brew with Pu-erh tea one day, it is what has been used in Asia for Centuries. Pu-erh tea has been highly regarded in China as a general tonic, as an aid to digestion of fatty foods and relieves hang-over symptoms. One thing that is never recommended is using flavoured teas in the initial brew. Another tea you shouldn’t use in an initial Kombucha Brew is Earl Grey. This is because is contains Bergamot oil, which and damage and contaminate the SCOBY. Flavoured teas can contain natural oils, artificial flavourings and artificial sweeteners. However, they are fine to use to flavour the Kombucha. So far I have used Hibiscus, Mango and Strawberry and Strawberry, Raspberry and Loganberry, with great success. Once you have bottled your brew for its second ferment you need to seal and leave it for 1-3 days. The longer you leave it the fizzier and less sweet it will get. 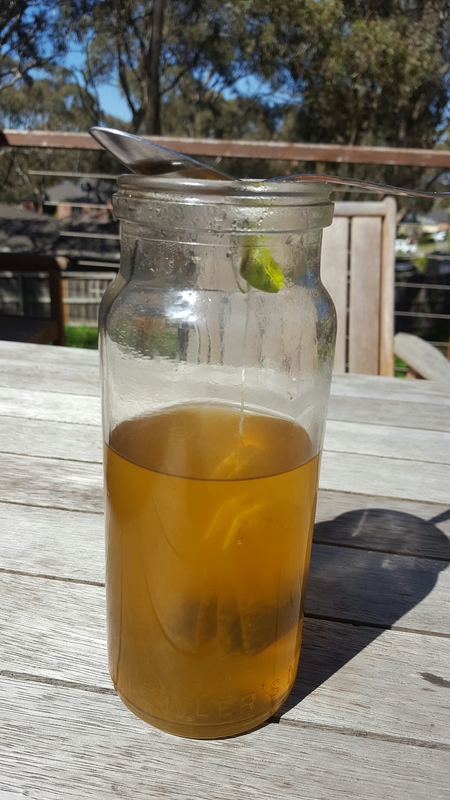 The Yeast and Bacteria in the Kombucha will feed on the sugar in the fruit etc, which creates Carbon Dioxide, which is the bubbles. You will need to use caution when opening the bottle as the CO2 can build up in the bottle. This batch has finished it’s second ferment, check out the Culture that formed in just 3 days! 2. Bottle brewed Kombucha with other ingredients, seal and let it ferment again 1-3 days. 3. After second fermentation is complete, open bottle carefully over the sink, strain, re-bottle and refrigerate.